Many of our clients are from Gen X & Gen Y, and many of our clients end up having their estate documents completed before their parents. Heck, sometimes before their grandparents! Why? Well we know from stories and experiences that contrary to popular belief, we are not immortal or invincible and sh*t can happen. Now, most of the time we have to nag our clients a few times before they get these items completed because truthfully, who wants to plan for death or being incapacitated. Not me! Which is why people frequently leave the matter to the very last minute and then make rushed decisions with bad information. 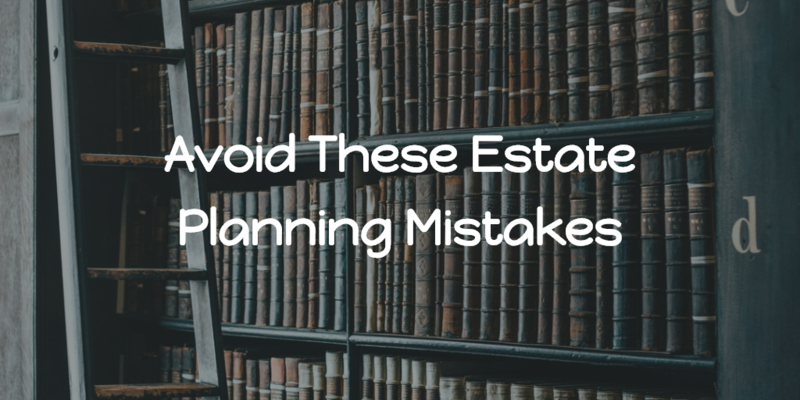 No surprise, common mistakes occur that are oftentimes very avoidable with a bit of planning and thinking a bit earlier. It’s an absolute train wreck for your family and estate not to have some kind of a plan in place at all. Even a simple will is far better than completely nothing. Ignoring the matter means that your entire estate will be decided by a probate court. And that means the judge involved could transfer your assets to just about anyone who makes a good argument in the required probate hearing.1 Do everyone a favor and at least prepare a basic will designating a default beneficiary for all your assets if nothing else. While many assume their spouse will take over everything, consider point two below, which is a common occurrence. Don’t assume the first party designated as a beneficiary will be around by the time your estate plan takes effect. Life happens and doesn’t stay frozen in time just because an estate plan designates one specific person to be a key beneficiary. Go a second or third layer deeper as a contingency if the first person chosen is no longer available and choose one or two more. You will be making your executor’s task much easier to do getting your assets distributed properly. Pro Tip: Mark "per stirpes" which will allow that asset to pass to the next generation. This is on many beneficiary forms but most don't know what it means. In the event your primary beneficiary predeceases you, a per stirpes beneficiary designation provides that the share he or she would have received goes to his or her heirs. Example: Client A wants to leave his account to his son, but unfortunately his son predeceases him. However, since client A marked "per stirpes" his account will now go to his two grandchildren (the children of his son). People don’t think about their health when they plan an estate. Very often a surviving spouse may need health support or your own condition may trigger a disability. These translate into costs that have to be addressed for medical services. Not having a clear path for power of attorney and health directives can be big issues if someone needs to make health decisions for you. Again, plan ahead and anticipate these challenges with solutions. An easy way to transfer assets early without taxes is a gift, but people hardly use it while alive. Any individual can transfer up to $15,000 (2019 Limit) without taxes on the amount or value annually to any other individual.2 This is an easy, simple way to liquidate parts of an estate early without the transfer having to go through the estate distribution process after a person passes away. Even better, you are entirely in control of the asset and transfer as opposed to relying on an executor. Choose an executor who is capable of handling the task of managing your estate, which includes a lot of paperwork and legalities.3 People frequently choose a sibling or a close relative to execute an estate. However, that doesn’t mean the person has the fortitude to do the job. Choose someone with the maturity and backbone who is willing to deal with the challenges involved, including appearing at hearings and fending off relatives. For more information on the four essential estate documents, click here.